Is it worth rebalancing or not? It is usually said that a regular rebalance let investors deal better with the market volatility, avoiding the worst effects of sudden negative movements. Rebalancing means capital preservation as the focus of every investment strategy. In T-Advisor, we apply systematic rebalances every second month for our model portfolios in order to avoid possible losses and improve the performance. 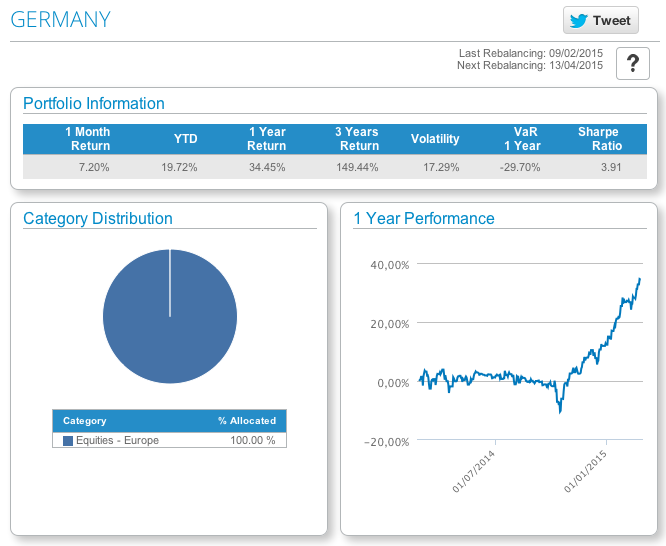 Let’s take an example with our Germany stocks model portfolio. Main figures say that 1-year-return is 34.45%, which is a very nice performance. But this result was only possible to reach with the right tools to select the assets and the regular rebalances. First of all, the portfolio has 10 different assets to diversify the investment. 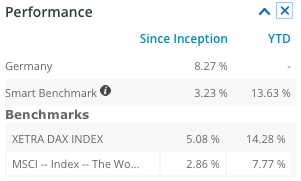 But let’s have a look if we compare the portfolio evolution with the reference indexes. How? With our smart benchmark. 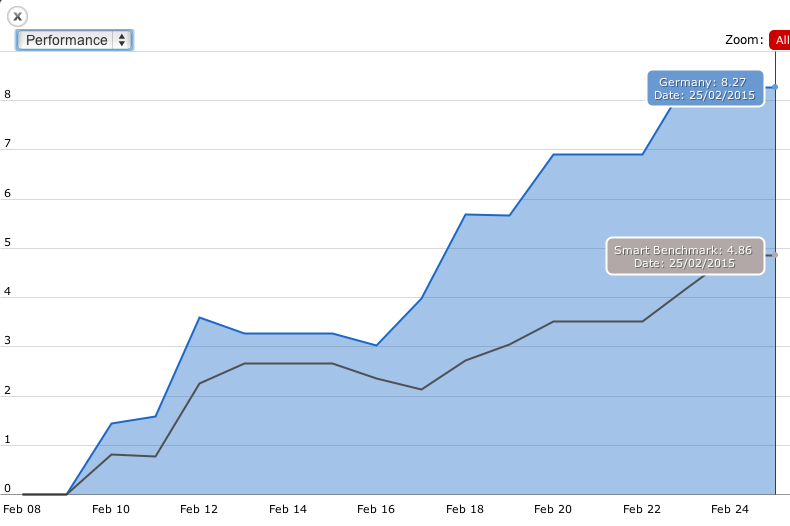 The portfolio has always overperformanced the smart benchmark since last rebalancing on February, the 9th. If we look it in another way: DAX has on February, 25th, 2014, a level of 9,699.35 points. On October, 15th, the worst day in the year, the level was 8,571.95. To sum up: -11.62%. What happened with our Germany portfolio in the same period? – 10.37%. And what about yesterday? If we compare the whole year, DAX has grown 15.53%, while our Germany portfolio has done 34.45%. As you can see, it’s worth doing a rebalance. In our case, our system works to find the best assets filtered by our scoring criteria. Every two months, we analyze the assets that work and don’t to create a new successful mix. Our methodology let us say that none of our ETF model portfolios, for instance, has never negative 1-year-returns. This entry was posted in Discover and tagged Model portfolio, Rebalancing, smart benchmark, Strategy on February 26, 2015 by Oscar Garcia.